This is a stunning life-size mountain goat taxidermy mount, posed climbing down a beautiful custom rock habitat base, with its head looking to its right side out into the room. The hair is a brilliant snow white and taxidermy quality is outstanding, earning this item our Excellent Plus™ overall quality rating. All applicable dimensions are included to help ensure this item will fit within your intended display space. 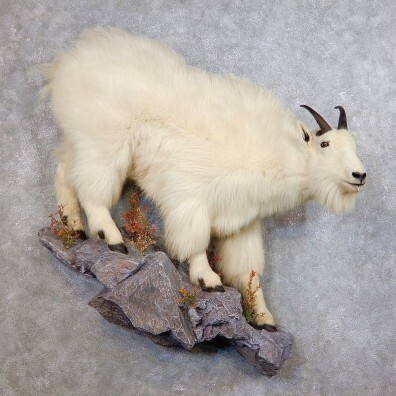 - This mountain goat exceeds the Safari Club International Silver Medal trophy book score requirement.